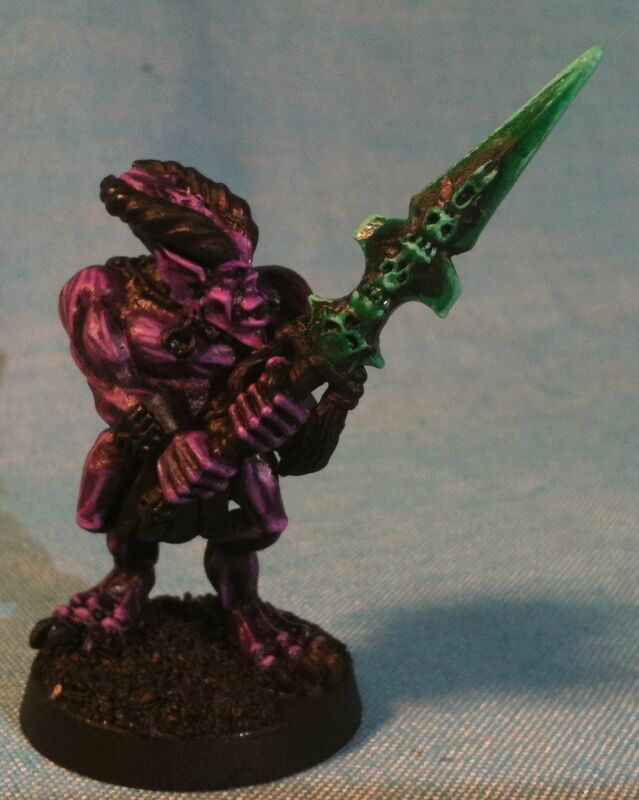 So I’d always planned on doing the Bloodletter’s sword green and the armour of the sorcerer green, so I once again cooked up a one of kind or in this case a two of a kind colour that looks like it glows. 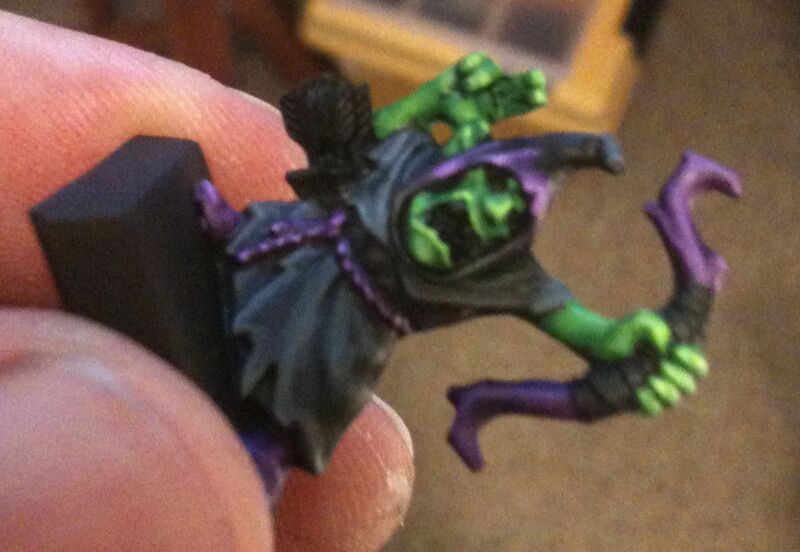 The key to the glowing effect is to go very bright/light with the highlights and start very dark with the lowlights. Washes and glazes are also essential to my technique. I’m not sure I can make it work with any colour but it works with green and blue, I generally use it on power weapons or magic weapons. 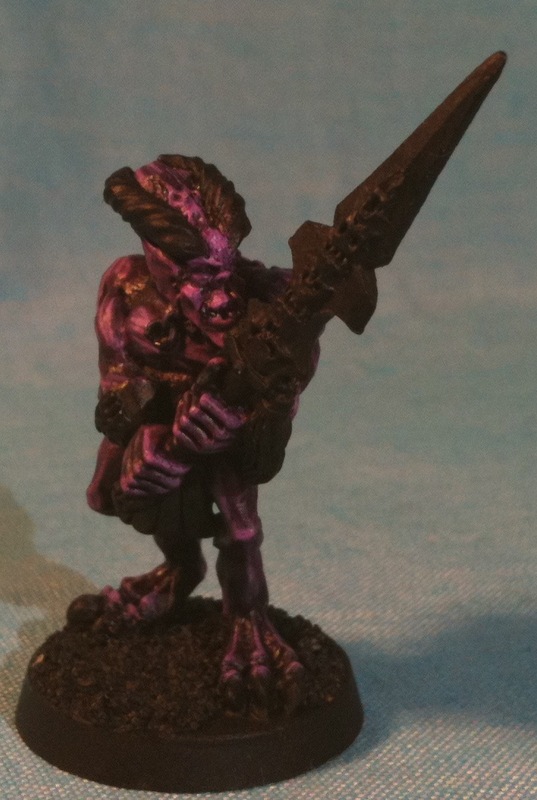 Purple can work too, but you have to highlight up to pink and that scares some people. 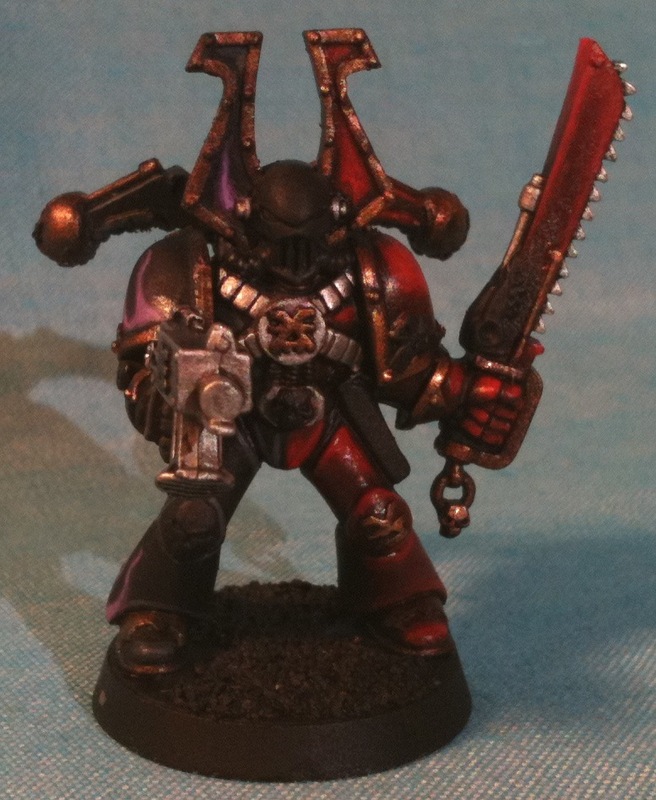 To get the effect seen here I had a black base coat. 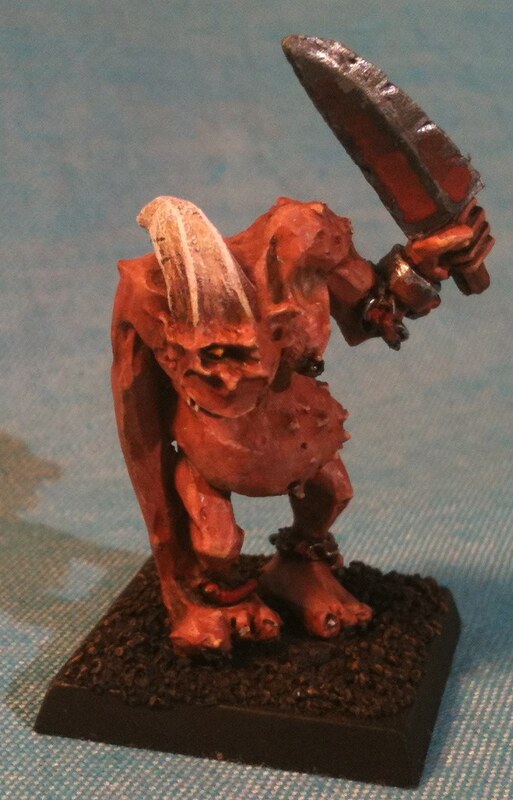 I then painted Orkhide Shade over it. 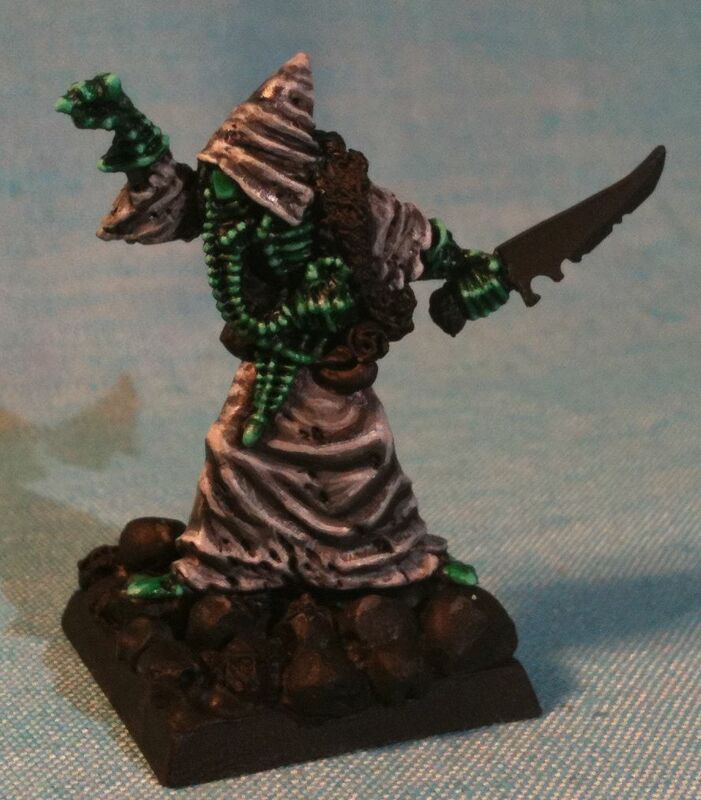 The new GW Foundation darkest green. 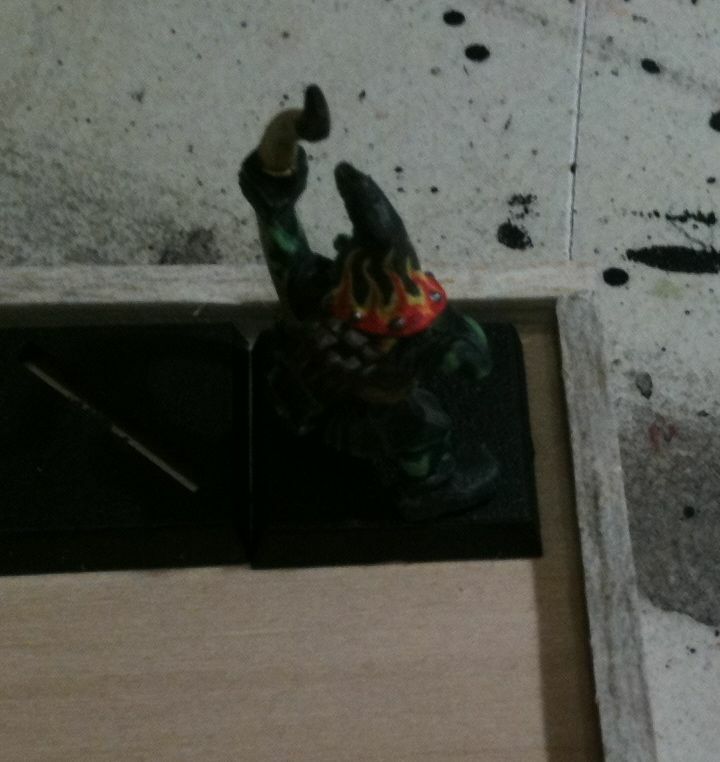 Then I really needed an inbetween shade, but I didn’t have one so I mixed Orkhide Shade and Vallejo Game Colour Sick Green. Then I think I did a pure Sick Green highlight, I can’t remember exactly it was yesterday. 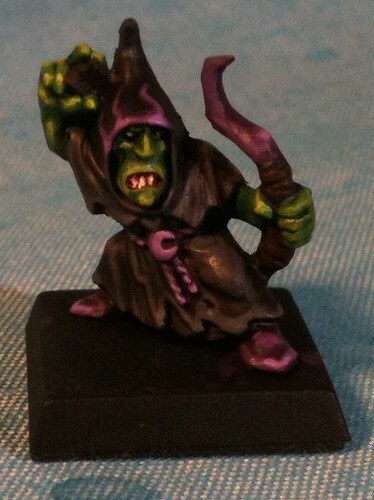 To keep the colour dark and scary I mixed up a wash of about 5 parts water, 2 parts old GW Green Wash, and 1 part Black Ink. Basically a much darker green wash, but still thinned so it would flow into the recesses. 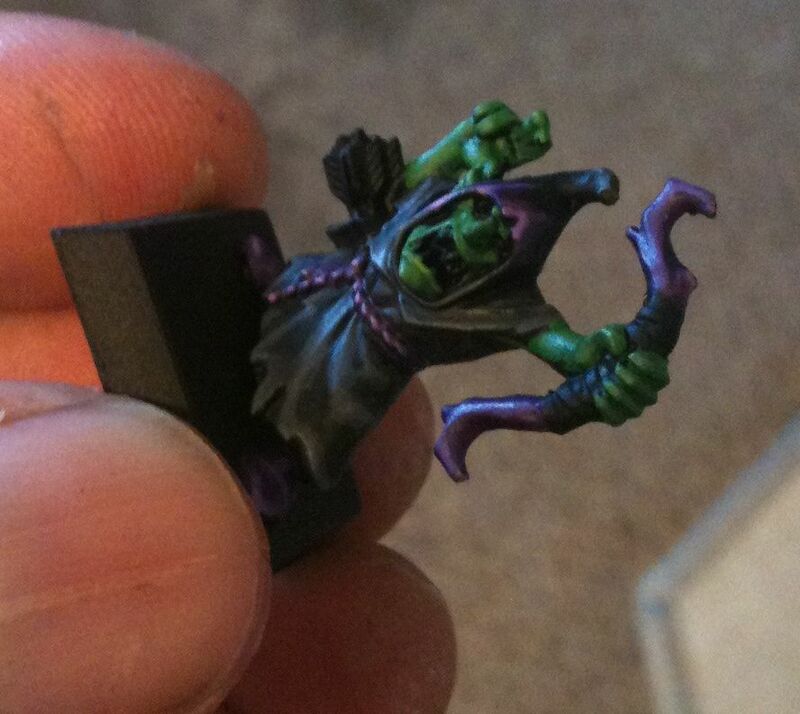 After that dried I got out Sick Green again and starting working up the highlights. I didn’t really have a good inbetween shade, so I mixed in an old GW Jade Green. 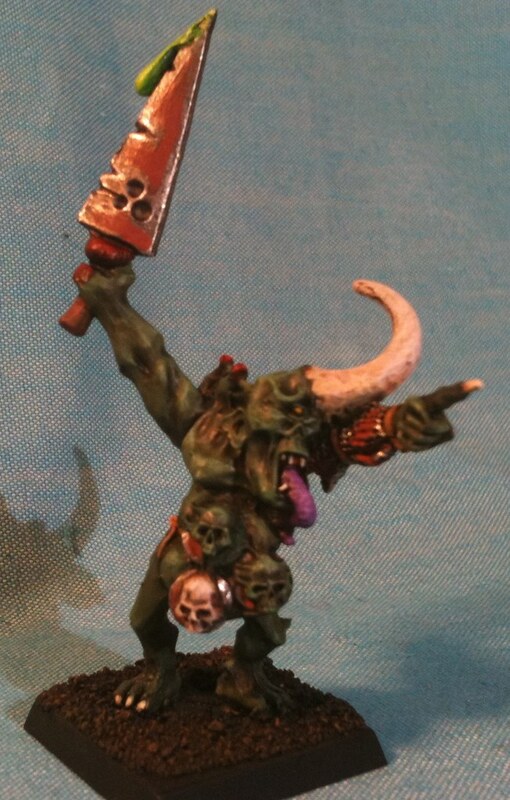 With the mixed colour and then pure Jade Green painted on as a highlight I then did a second wash. 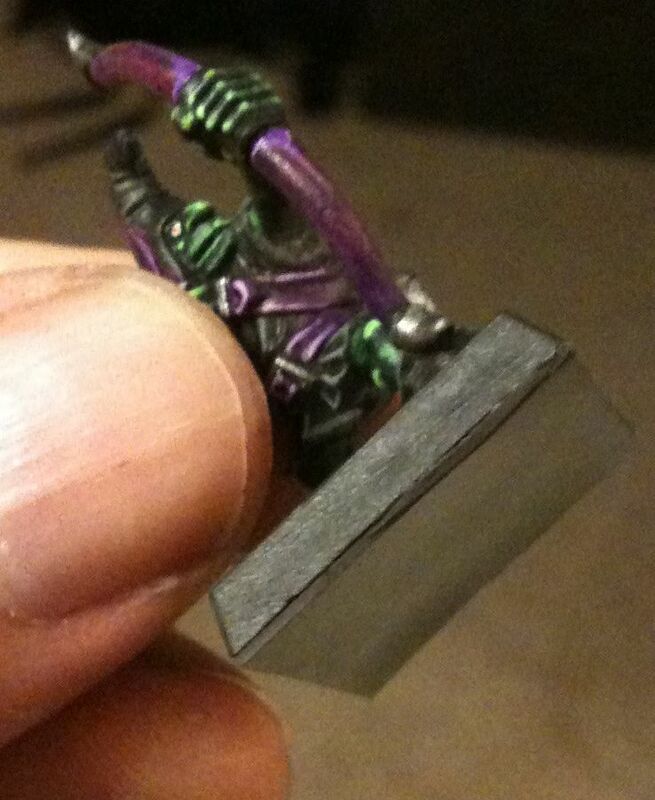 This time a thinned down Waaagh Green Ink which is an extremely old GW/Citadel product. 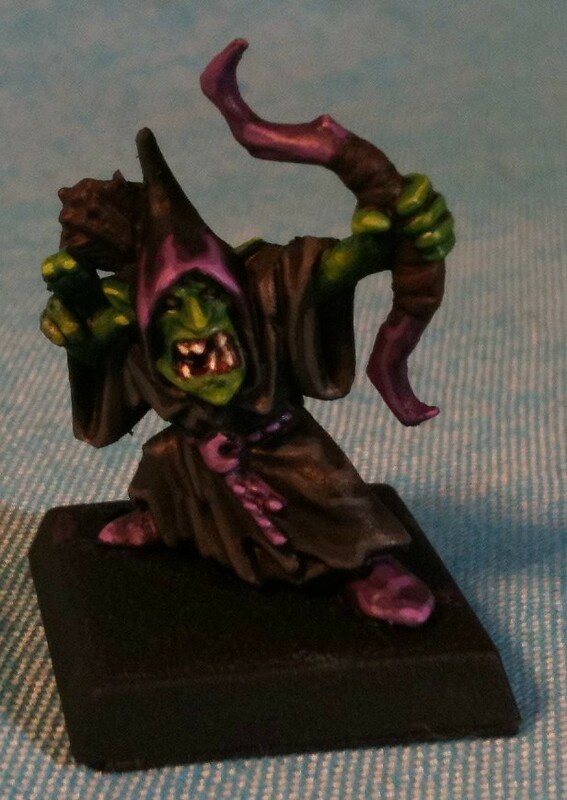 When that was dry I started highlighting Jade Green again, but I also wanted to darken a few spots so I used the new GW Green Wash just in a few spots. Then more Jade Green and the first green glaze. GW used to make them, they were under appreciated by their clientele I wish I had them all, but I only have a few, they have red lids. Vallejo makes some glazes, I saw them at Imperial Hobbies today. After some Jade Green and green glaze I wanted to go more extreme so I got out this bottle of Green Grey Vallejo Model Colour #971. 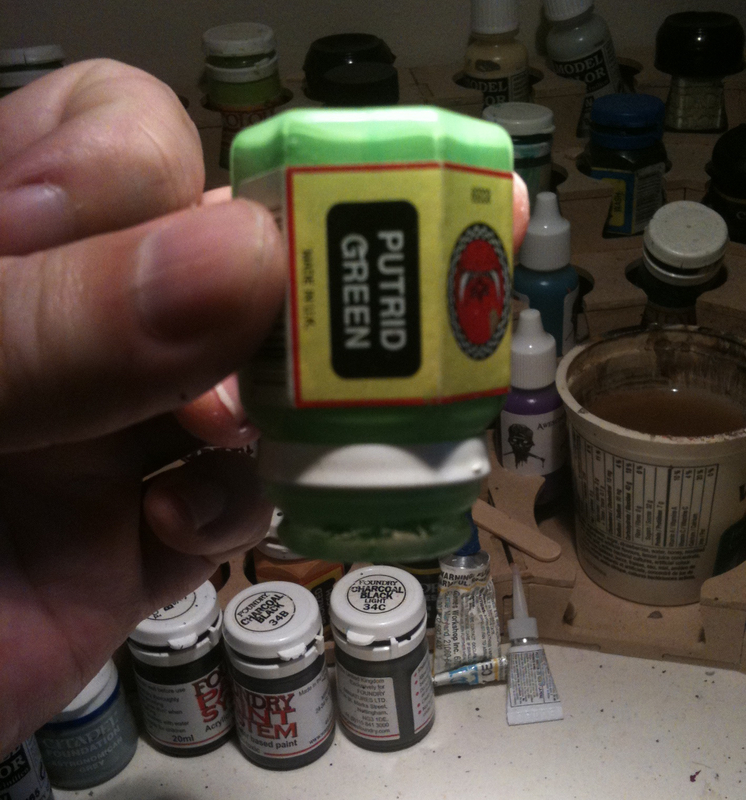 I mixed this with the Jade Green on my P3 Wet Palette. 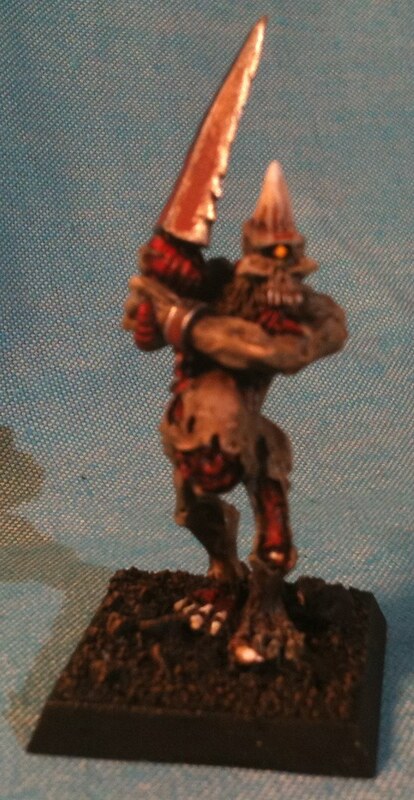 I then painted this pale highlight on. 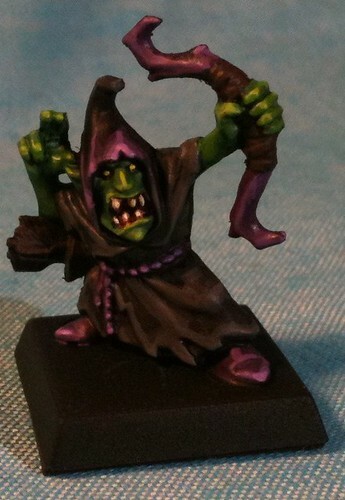 Then another green glaze then an even paler extreme highlight was done and it was off to my bedroom to take the photos. As I mentioned I went to Imperial Hobbies today and bought some more paint and a couple of brushes. The brushes were disappointing but they were cheap. Tomorrow I will go and buy some Deserres brushes that I’ve gotten used to, they hold their point pretty good and come in all sorts of sizes. 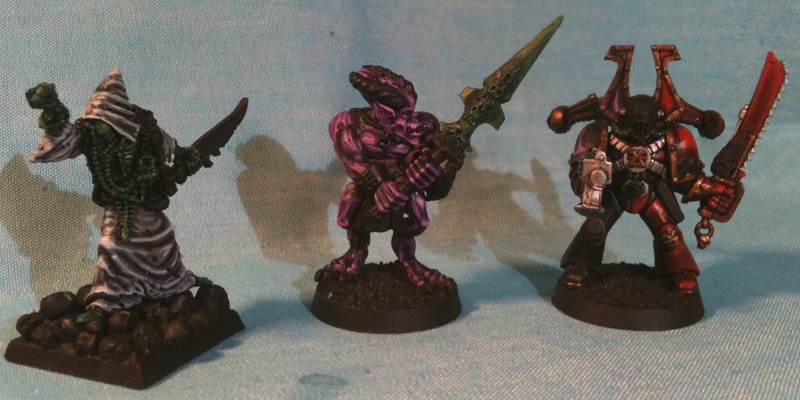 I also bought some very bright or light colours which I’ll use on the Tzeentch and Slaneesh models I seem to be doing up, but mainly they are for the future. The Mr. Color Steel and the Flat Green will get used sooner, as might the Sky Grey. The Gale Force 9 flock I bought the day before to use on the Goblins and other bases going forward. I’m trying to use a variety of material, instead of just sand all the time. Good morning sports fans. 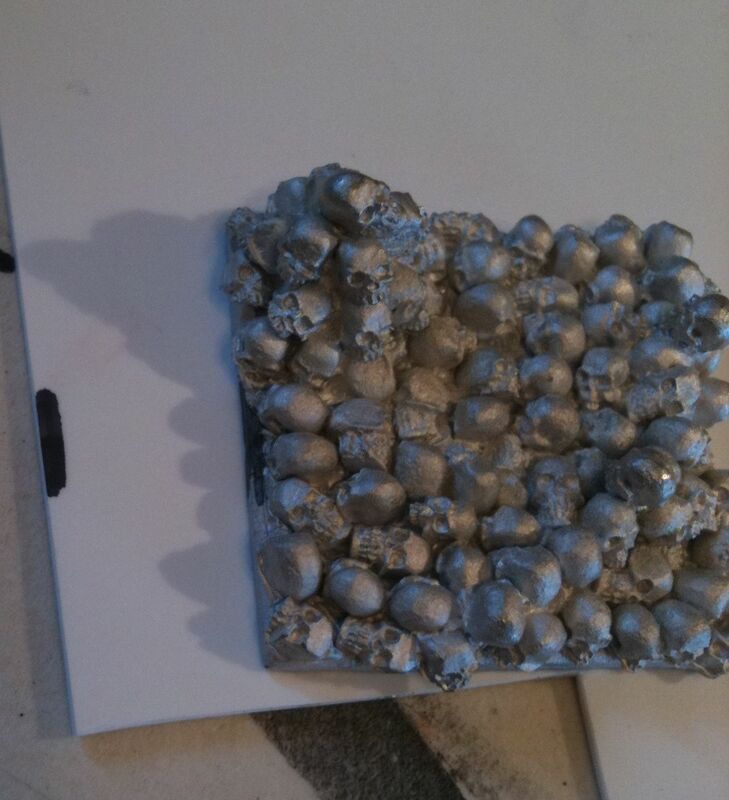 I was up until quite late last night cutting little squares of magnetized material so that I could show off a completely built but not completely painted magnetized movement tray for a Horde of 54 Night Goblin Archers. 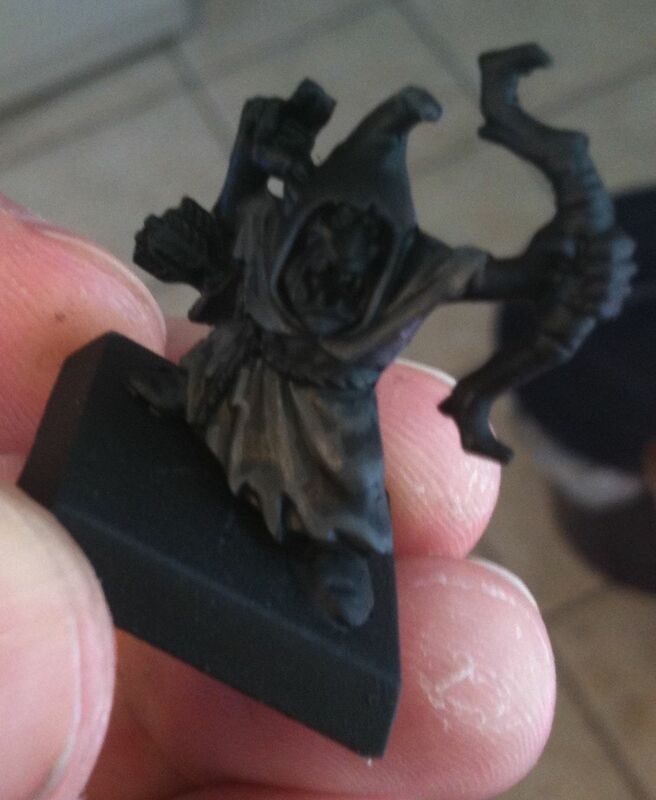 One of my discoveries late last night was I only had 50 Night Goblins in the unit, well 49 and a hero so I cleaned and prepared five more archers which I’ll paint this afternoon. 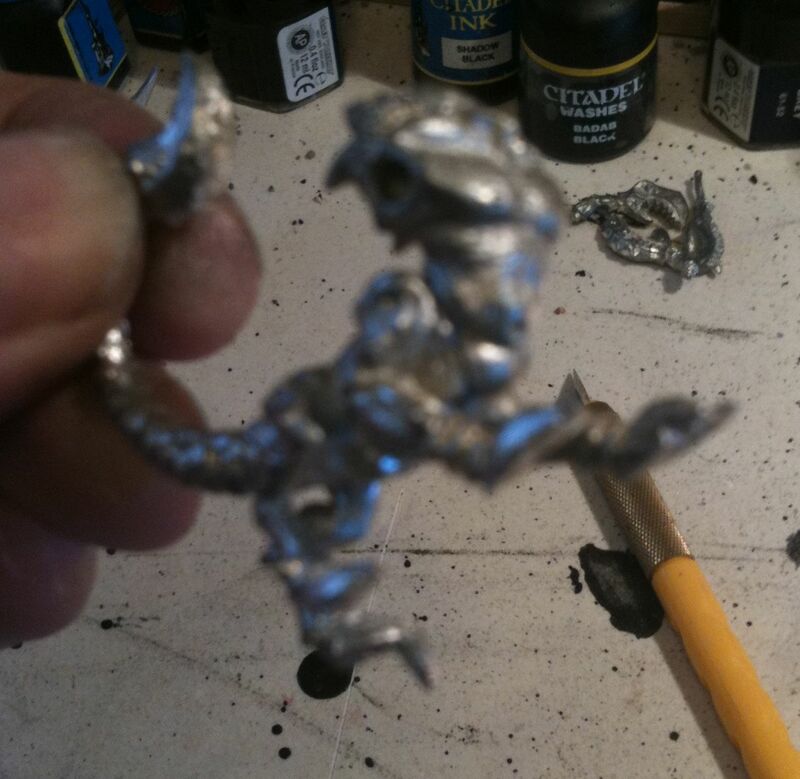 I’m up obscenely early bringing you the freshest miniature painting news from my painting table. 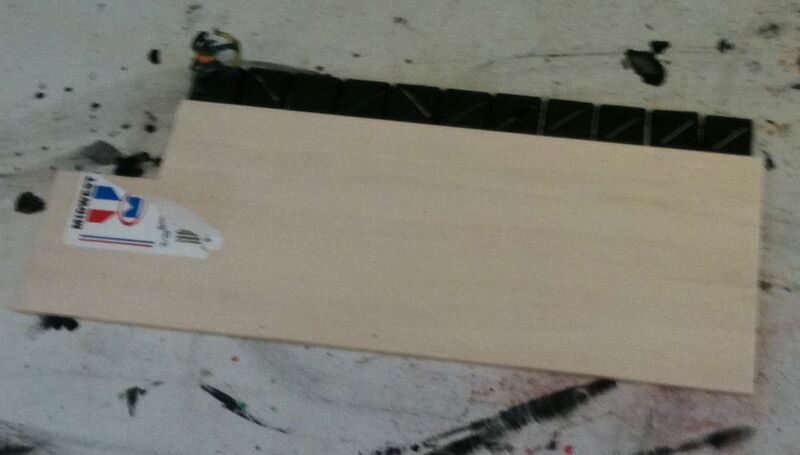 Making a magnetized movement tray isn’t any harder than making a non-magnetized one, but it does take time. 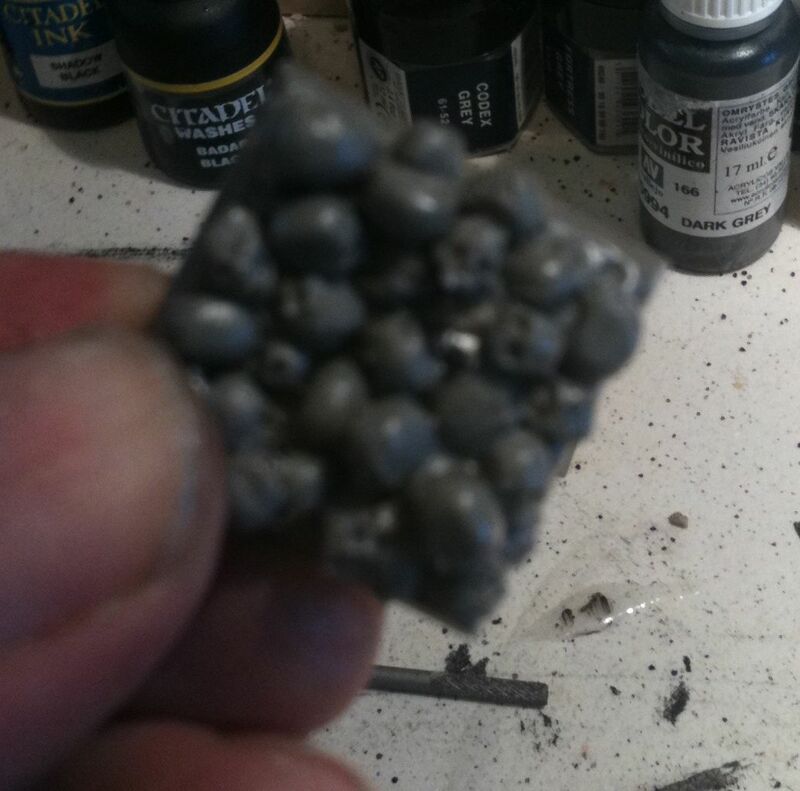 The most time consuming part especially for a Horde of 54 Night Goblins is cutting the small squares of magnetized material and affixing it to the bottom of each miniatures base. 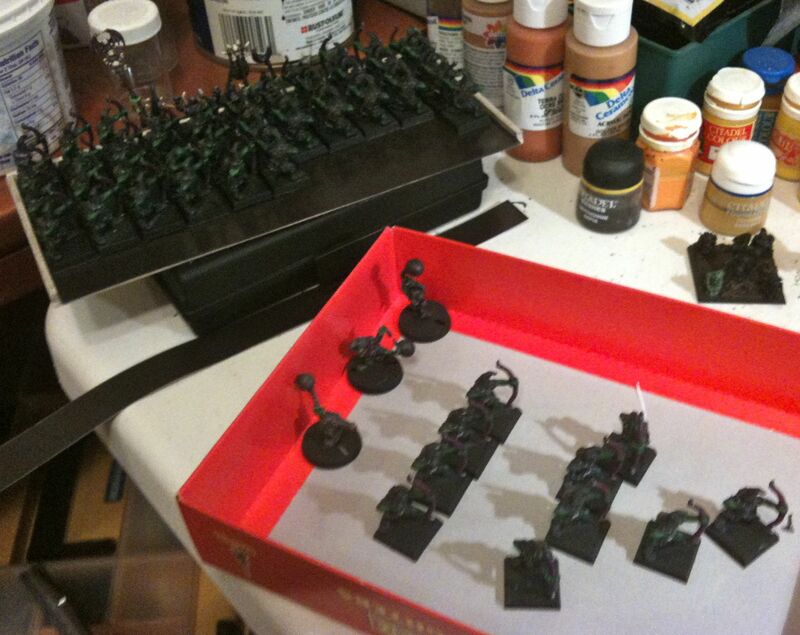 You could use regimental bases to speed up the process, but I did 55 individual bases. 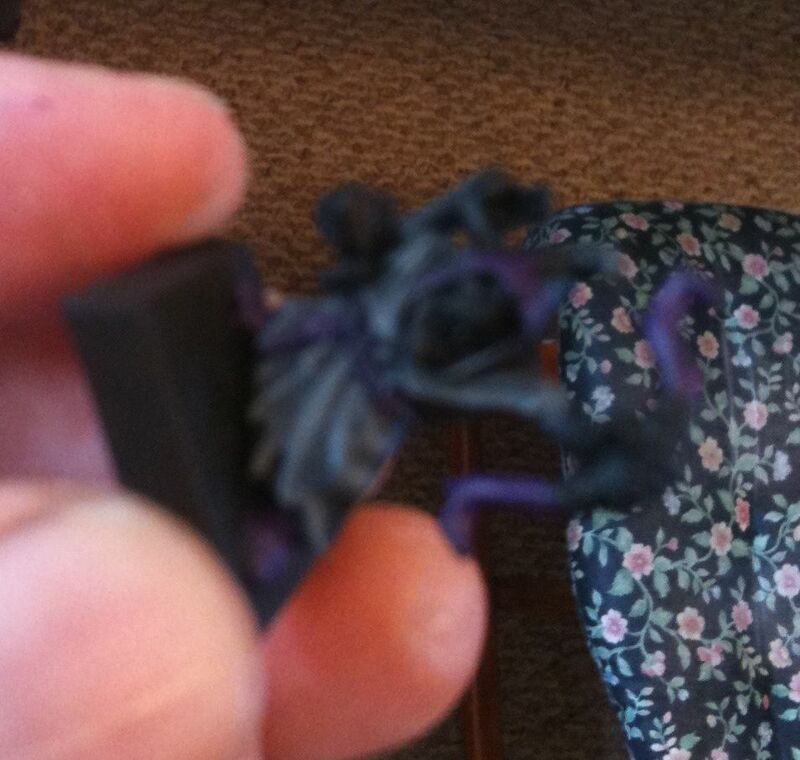 The hero was of course magnetized too. The first thing you need to do is determine how large of a movement tray you need to make. In GW land the most common base sizes are 20mm square and 25mm square, so the interior size is likely some multiple of those two numbers. I’ve found they are sometimes a bit bigger when they have a miniature on them so it is good to leave a few millimetres wiggle room. 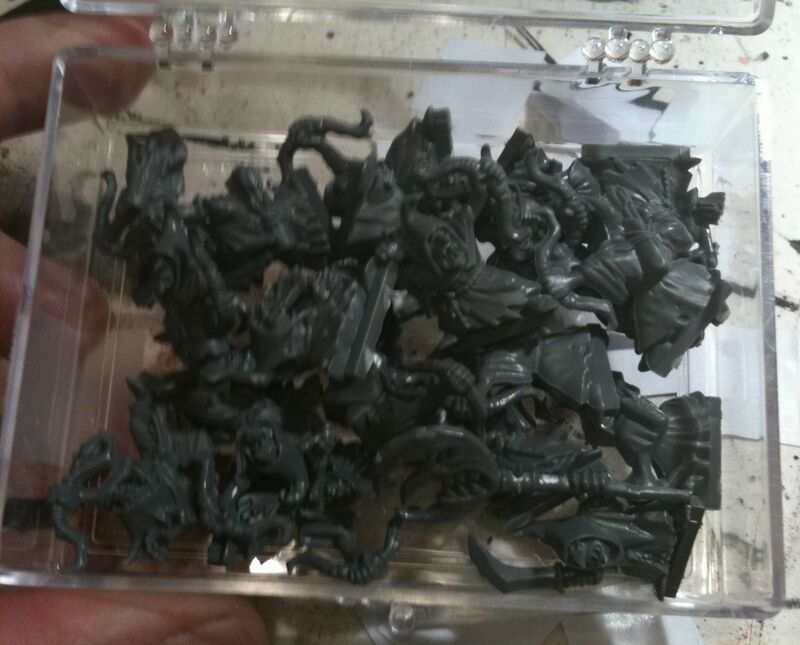 The movement tray was to be 11 goblins wide and 5 goblins deep. 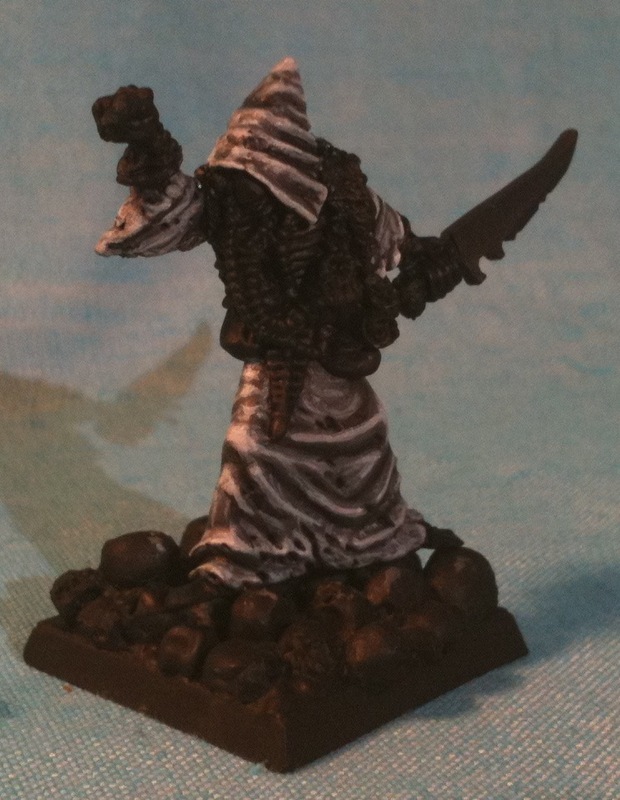 I grabbed the piece of balsa wood I used for the Plaguebearers base and it was just a little too small. You need to allow 3-4 mm depending on the material used for the edges. 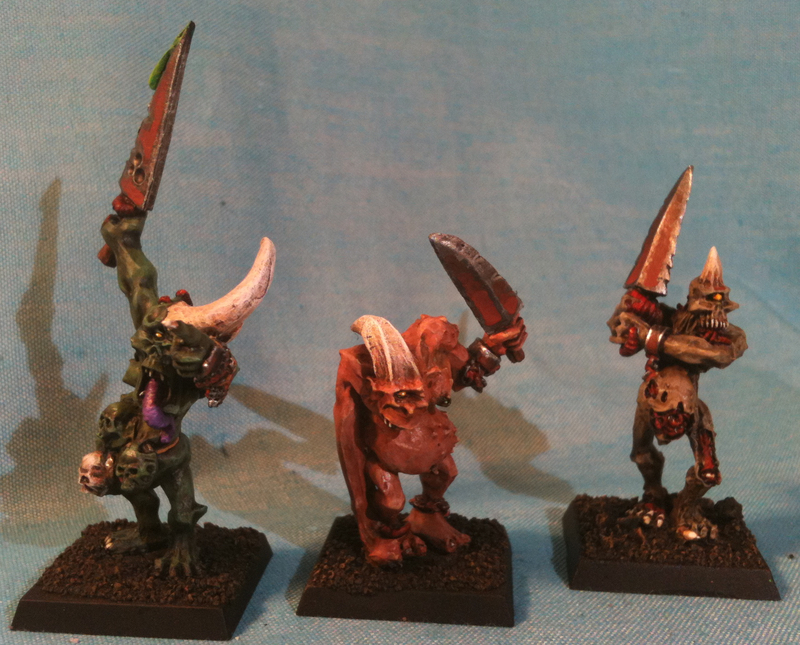 I make my bases with three edges just like the ones GW sells. Maybe four edges is better, I don’t know I’ve only made a few movement trays in my time. I play mostly round base games where you deploy in dispersed formation not ranked up. After cutting out the bottom of the tray it is important to check your measurements two or three times. I used a metal straight edge and an exacto knife to cut the balsa wood. Go slow and apply moderate pressure, eventually you may need to apply more pressure but by scoring it once or twice at low pressure you have a good groove to follow. With the bottom ready it was time for the front and the sides. I measured and cut the front first. Then I use the front in measuring the sides. I measure and cut one side then I make a twin. When all three edge pieces are ready it is time to glue them to the bottom of the movement tray. I used balsa wood for the sides as well, a little deeper piece than before about 3-4mm wide and about 5-6 high. I wanted a deeper tray to accommodate the magnetic material. Now you have to measure the inside space of your tray. You only really need to measure the width. Once you have your measurement transfer that measurement to the magnetic sheet. I used a silver sharpie to mark the black magnetic material. I again used a metal straight edge to cut the material. I used a depth of 10cm for the other measurement, it overhung the wooden bottom by a couple millimetres but I figured it was worth it. 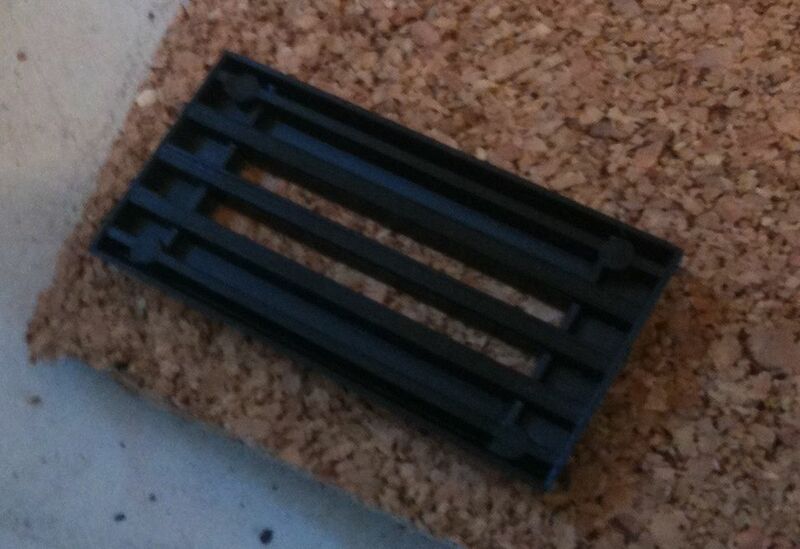 I used simple wood glue (Weldbond brand if it matters) to glue the magnetic material to the bottom of the tray. Make sure you get the poles correct. The other magnetic sheet I used had adhesive already on one side so it can only be applied one way so make sure the bottom of your tray isn’t repelling. I then put something that weighed a kilo or two on the tray bottom and let it dry. I was working on a number of different little projects at the same time, including how I was actually going to finish the bases of the model. I have Autumnal materials which look alright but some of them I’m unfamiliar with. Peabody wrote a tutorial on how he does his bases and I’ll be doing something similar. 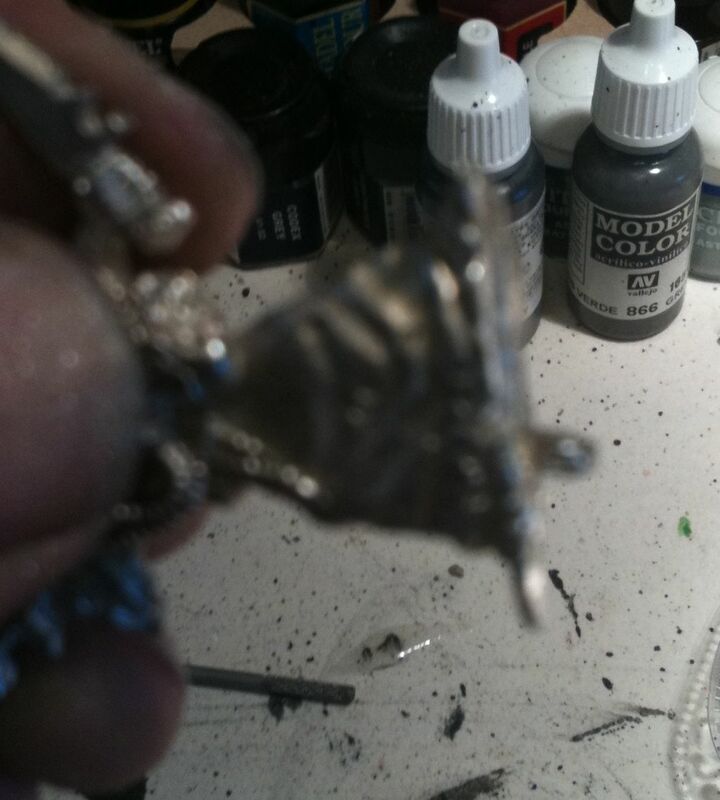 I actually have the Matte Medium and plenty of pigment and ink, but I think I’ll just use white glue, that is how the test model was done. I don’t want to make a mess of the entire unit. Now after some drying time, which you really don’t have to wait for if you’re a keener, it is time to affix the magnetic material to the bases of the miniatures. This is made really easy by the fact that I bought two types of magnetic sheets. I bought both types at Urban Source on Main Street in Vancouver, but you could order the stuff off the internet I’m sure. I carefully measure 20mm and then using the metal edge and the exacto knife cut out a long thin strip. I actually needed four of them. I could fit 15 bases on one strip. It is actually pretty tough making a long perfectly straight cut with an exacto knife so in hindsight I might have been better off marking it with a pen and using scissors. Once I had the strips I just grabbed a mini, put it on the white side, traced the edge and cut it with the exacto. Eventually I switched to cutting the strips with scissors. 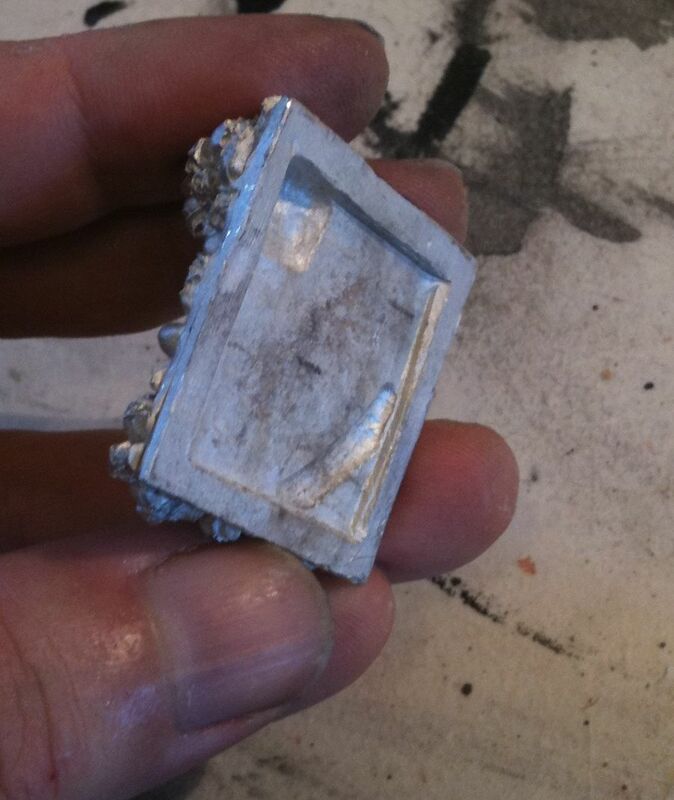 Once you have your little square just peel off the backing and put it on the bottom of the miniature. 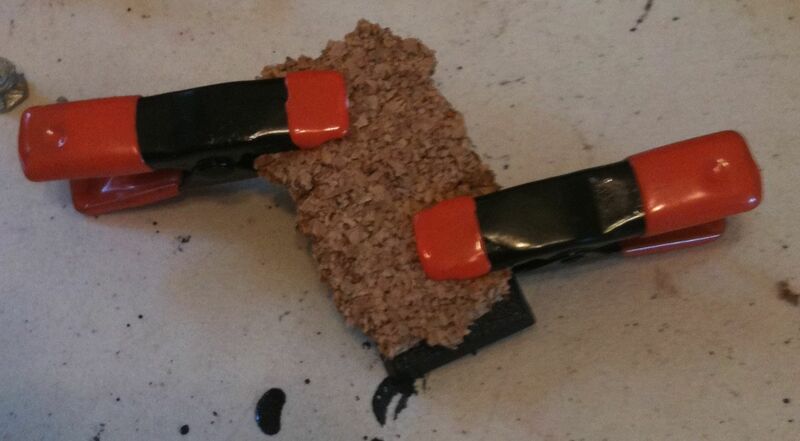 It is better to have a little bit too much magnetic material than too little. It cuts easy so once you have it on the bottom of the base you can use your exacto knife to trim it off, just like cleaning flash from a miniature. Now since I’d let my glue dry on the movement tray, I could rank up my models as I magnetized them. I did do the upside down test, all three plastic Night Goblins stayed affixed to the tray, even using less powerful magnets. I never tried this test with my metal models in the unit nor did I tip the whole unit upside down. The models stay put quite well and make it so it is easy to move the tray and the unit around. Tipping your whole unit upside down and shaking it is just dumb. 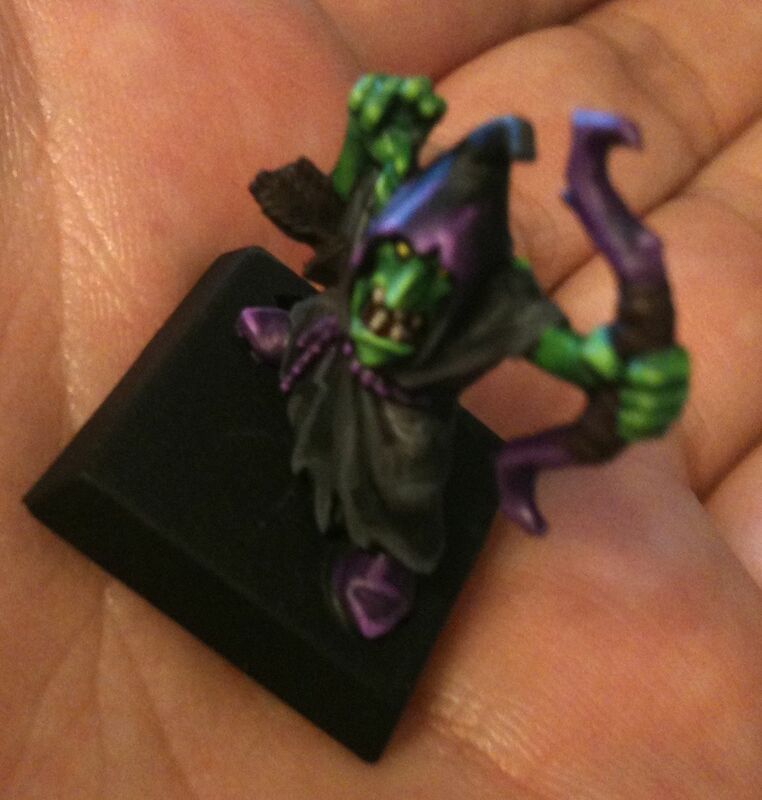 Once I discovered I was a few goblins short of my desired unit size I got out some more Night Goblin archers that I got off eBay. I cleaned them and magnetized their bases too. Then I ranked them up, took a picture and went to bed. See that wasn’t so hard, you can base the models however you want and use a little bit of basing material along the edge of the movement tray to help it blend in some more. 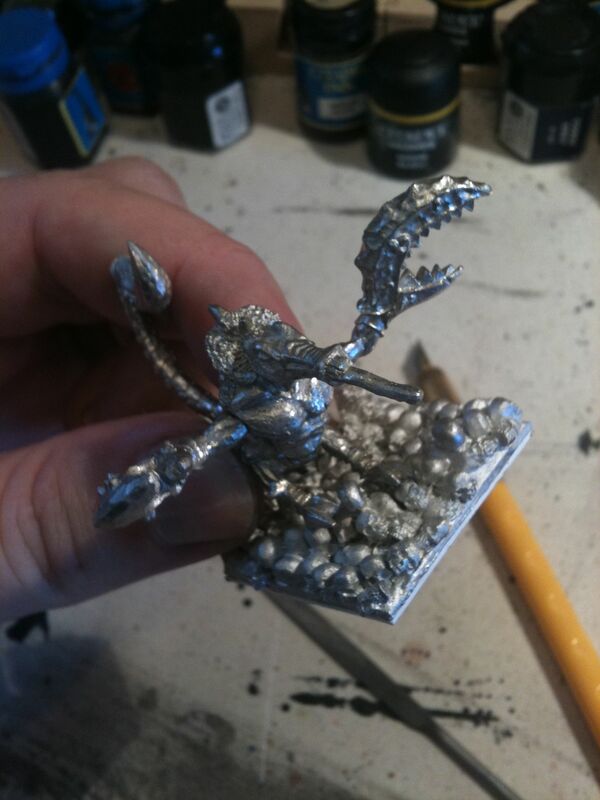 The models, even the metal ones, stay in place when you tip, tilt, and jostle the tray. None of them tip over or fall out. Yet you can pluck them out without any trouble as well. Today I’ll be painting five more archers as I’d rather have one unit completely finished than borrow an archer from my other unit for the game on Sunday. 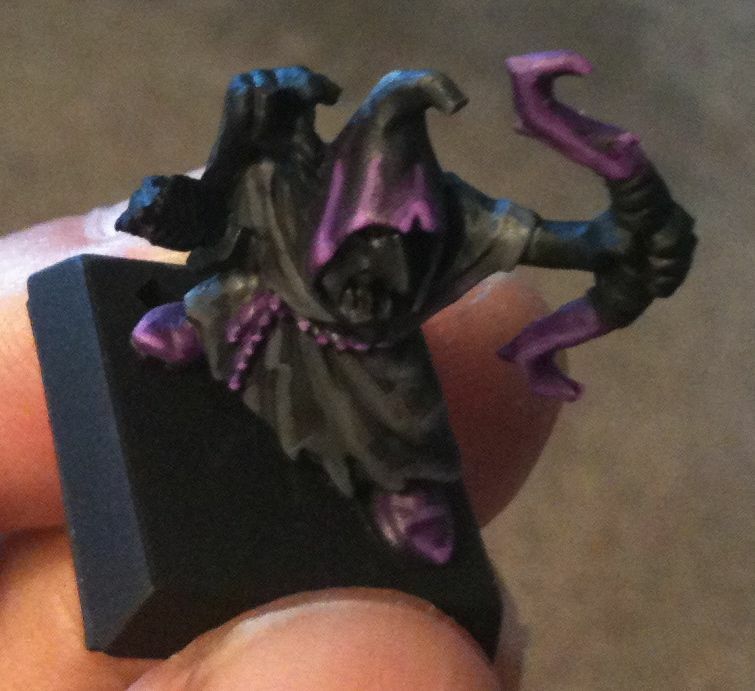 I’ll also be test basing another archer and my fanatics until I’m satisfied it looks as good as I can get it in the time allowed. 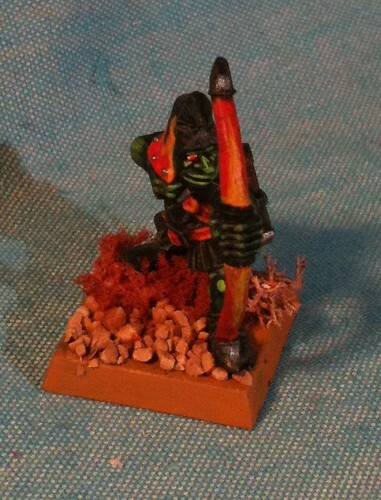 I dug out yet more basing material, including some fancy leaves I got off of Antenociti’s Workshop, they almost seem too nice to use on 15 year old, not terribly well painted, plastic goblins. I’ve been stockpiling stuff for years and it is time see it on the table, so some of these leaves will find their way onto goblin bases, maybe just the front row, I painted them nicer too.